We have our homeschool evaluation tomorrow. I've set us up for grand success, no stress necessary, but still the day has its own way of looming. Today I should have been compiling, sprucing up, and spit-polishing our review of the year, and it started out that way, but...well, life took over. Specifically, we discovered yesterday that it was Take A Poet To Work Day today and , well, we love us some poets over here, so down the rabbit hole we went! Look! Poet puppets! Ready-made at Tweetspeak.com! No, I could not resist. 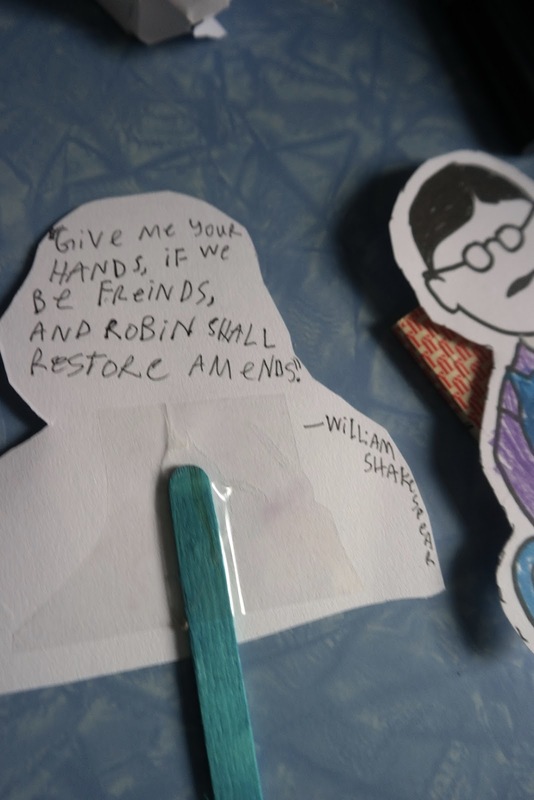 Ani and I then spent hours coloring, cutting out, and researching the poets. Mama, do you know what colors this poet liked? Do you know if they had dark skin? 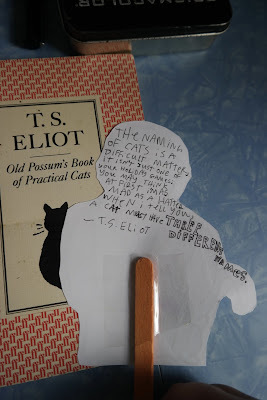 We looked up poems to write out on the back, because what is the point of sharing a poet if it doesn't come with some fabulous words? We read haiku, and the beautiful words of Maya Angelou. I pulled out T.S. 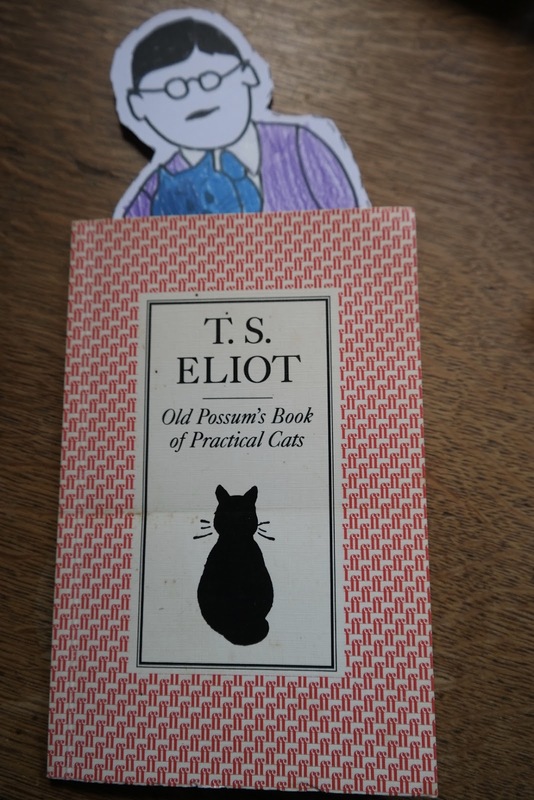 Eliot's Old Possum's Book of Practical Cats and Ani carried it around for two days, reading it aloud and to herself. T.S. 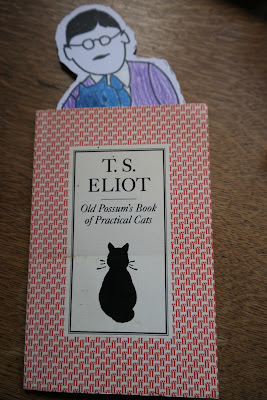 Eliot, you get her!! "The naming of cats is a difficult matter, it isn't just one of your holiday games. You may think at first I'm as mad as a hatter, when I tell you , a cat must have three different names." You know where this is going, don't you? She does live with theater folk...yes, we had to disclose that there is actually an entire musical devoted to the cat poems of T.S. Eliot!!!!! Blew her mind. Cue youtube. Book in hand, she watched through each one. Dan took Will to work. Of course. Mama did you notice that most of these poets are men? You know, that's funny, because the first REAL LIVE POET I ever knew was a woman, so I just assumed most of them were girls! We did have Emily and Maya and Christina Rossetti, but she had a point, and so I drew a sort-of-near likeness of that very same real live poet, the wonderful warrior poet, Wendy McVicker and we made her into a puppet. Sorry, Wendy; we love you! The gang! Wendy, down right. We made a few, 'cause she was our favorite. Who Has Seen Christina Rossetti? Neither I nor you...Nancy Drew, perhaps...? ...and we dropped Issa and another Wendy off at the local health food store. They seemed to fit right in. Don't worry spiders! I keep house, casually. Well, I'll let you know how it goes tomorrow. See, I'm still not shining things up around here, I'm blogging about the rabbit holes. Instead of figuring out how to show there is learning happening here, we just went with the learning. Yes! Speaking of poets, not many people knew that my Papa Marzo wrote poetry during his long life! 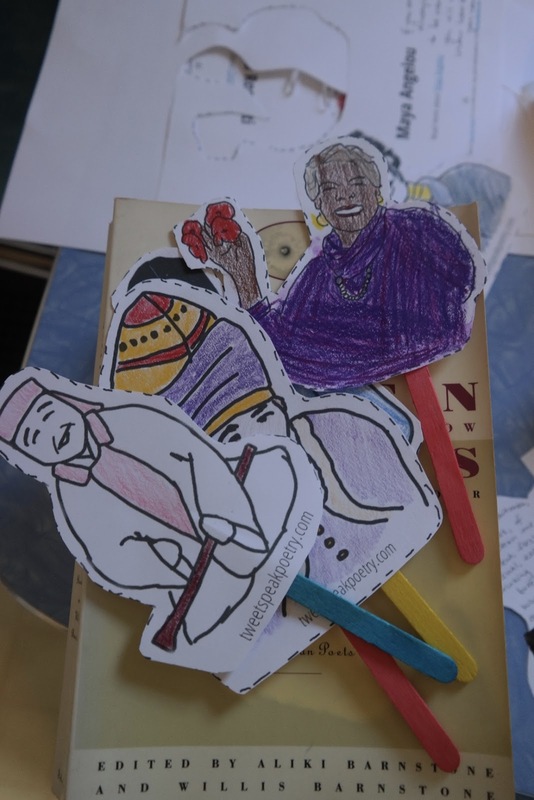 Twenty years ago his sister Jean compiled a small booklet of the ones he could find - tributes to friends during celebratory moments in their lives, anniversary love notes to his wife, my grandma, Eliza, and thoughts about life. My sister and I were asked to read two of them during his service, and I thought you might like to read them. they're sure and they're predictable. promise is sure to come. we have our seasons, too. That lie behind that wall. What fun to have been in the rabbit hole with you!I love your puppets - a marvelous project that Ani really grabbed on to!